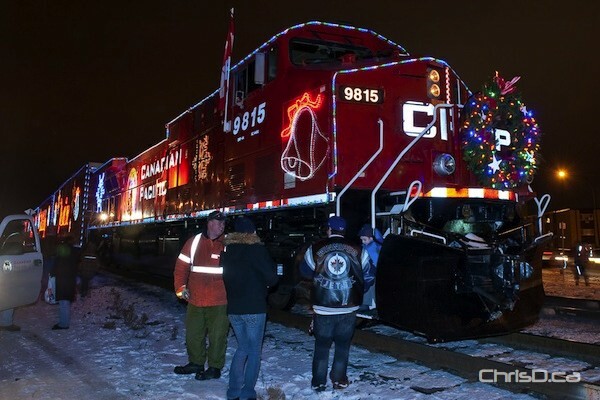 About 500 people came out Saturday night to welcome the Canadian Pacific Holiday Train to Winnipeg. The train stopped on Molson Street for a roughly one-hour concert as part of the annual holiday tradition, while at the same time collecting non-perishable donations for Winnipeg Harvest. Singers Valdy and Tracey Brown entertained the crowd, who came bundled up and prepared to stand on their toes to take in the fun. Now in its 13th year, two trains are trekking across Canada and the United States making about 140 stops in cities and towns to spread holiday cheer. The holiday freight train is hard to miss, donning hundreds of thousands bright LED lights covering 14 rail cars. After Winnipeg, the train travelled to Portage la Prairie and Minnedosa on Sunday, and will arrive in Saskatchewan today to continue its journey west. The Weather Network will be hopping on board for the Saskatoon to Calgary leg. Since 1999, $5.6 million has been raised by the CP Holiday Train for local food banks, including 2.5 million pounds of food. CP made a $5,000 donation to Winnipeg Harvest during their stop.